Here's sort of a typical day right now. And I wonder why I don't have time to paint! Cleaned out canary cage (they are so darn messy!) and fresh food and water. 7:00am - Food and water to chickens, plus their morning treats. Shoveled driveway. It was only a couple of inches. 8:00am - Breakfast! Raw oatmeal with homemade raw milk yogurt and organic honey. 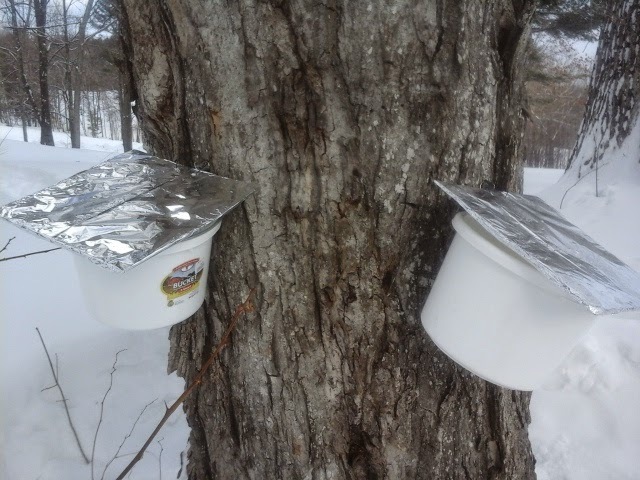 Fashioned bucket lids for the sap buckets. I think they will work. will hold. So far, they are staying attached, but are flopping open to some degree. 9:00am - Warmed up the cup of coffee I haven't drunk yet. Called to check on a sick friend. Arranged for pick up of barrels we will use for sap s torage. 10:00am- Drove to go get barrels. A couple of towns over. Snow flurries. I thought it was going to be sunny today! Noon- back home with the barrels. They will work. Washed and sanitized them (had to do t his in the shower, since our outside faucet froze, and it's too cold out there anyway. Improvised a washing tool with rags tied around the end of my broom handle. Finally had that cup of coffee! And some lunch - celery sticks with garlic cashew butter and some green beans. It was good, really! 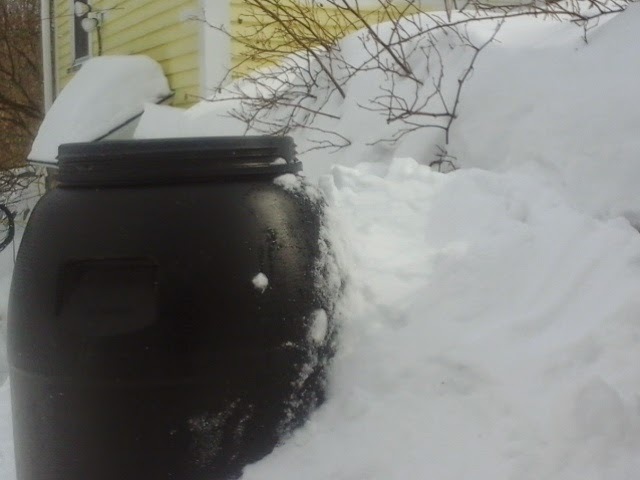 1:00 pm - Took barrels outside to set them in a snowbank (sap has to stay cold) This took awhile, and I'm not sure my plan will work, but anyway, I dug around and then shoveled snow back around them. 2:00pm Carted the firewood to the cellar from the garage and stacked it. Fresh water for chickens, who mucked theirs up as usual. Planted the celery seed, first round. attached some bungies to sap bucket lids to help secure them. didn't have enough bungees for all the lids. 3:00pm- Checked temperature in cold frame. Soil is completely frozen still. I really thought it might be starting to thaw. Looks like the early spring stuff wont get plant so early! Started supper - going to be an herbed rice mixture with citrus and nuts served over a bed of steamed kale, and carrots. I haven't decided if the carrots will be cooked or raw. Steve prefers cooked. 4:00pm Sat down (finally!) to read, but got a phone call. Decided to write this blog before Steve gets home. 5:00pm. Here I am, writing the blog. , I will put the chickens to bed in just a bit, and finish supper. We will eat about 6PM, watch the news and weather, and maybe a little TV. Meanwhile, I will read until Steve gets h ome.